It took quite a while before national media began to catch on to the gravity of the aftermath of the enormous and powerful storm which ravaged much of the nation’s midsection last week. Initially, the blizzard northwest of the center of low pressure on the high plains got quite a bit of news coverage because it hit the Denver metro area hard. The storm was very accurately predicted days in advance, and turned out to be every bit as extraordinary as models had forecast. During the first two days of the storm’s trip through the Central Plains, winds gusted to 100 mph near Amarillo, 96 mph at Pueblo, Colo., and 80 mph at Denver International Airport. As the exceptionally intense low moved to the northeast, its initial ferocity began to wane a bit as central pressure began to rise. In any case, some of the most devastating effects of this storm are still occurring in Nebraska. In a Forbes magazine article, Marshall Shepherd, atmospheric science chair at the University of Georgia, consulted several experts in related disciplines. Ken Dewey, regional climatologist at the University of Nebraska, told Shepherd: “The event was a ‘perfect storm’, similar to a hurricane arriving on the coast at high tide. A sudden warmup, an unusually deep snow pack that 'flash' melted combined with heavy rains and a frozen ground with 100% of the melt water and rain running off (i.e. no infiltration). Add to that the river ice suddenly breaking up with huge ice chunks slamming into highway bridges knocking them out and water overtopping the roads and washing them out left some communities [stranded]." 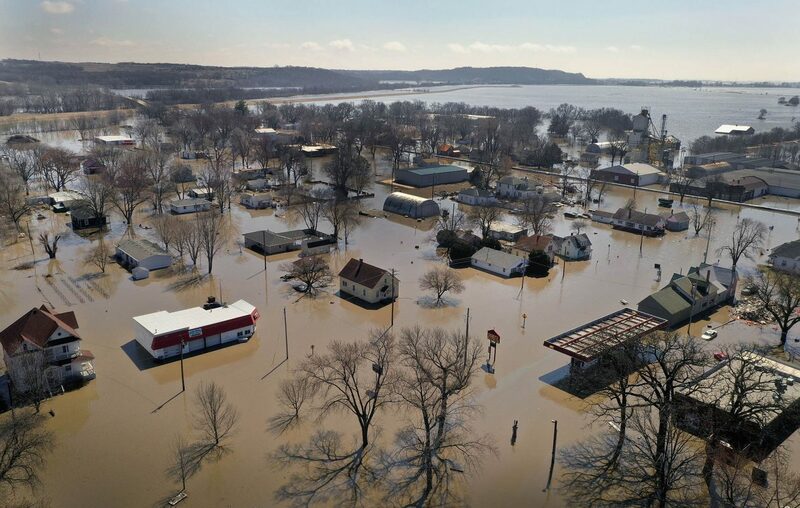 The ongoing disaster in Nebraska continues, and record flood crests have occurred not only there but in Iowa and South Dakota as well. Nebraska Governor Pete Ricketts says the storm damage was the costliest and most extensive in state history. At least $800 million in livestock and crop losses have occurred in March 19 estimates. Here is some high resolution NASA Terra satellite imagery showing the drastic expansion of flood waters on streams in northeast Nebraska. 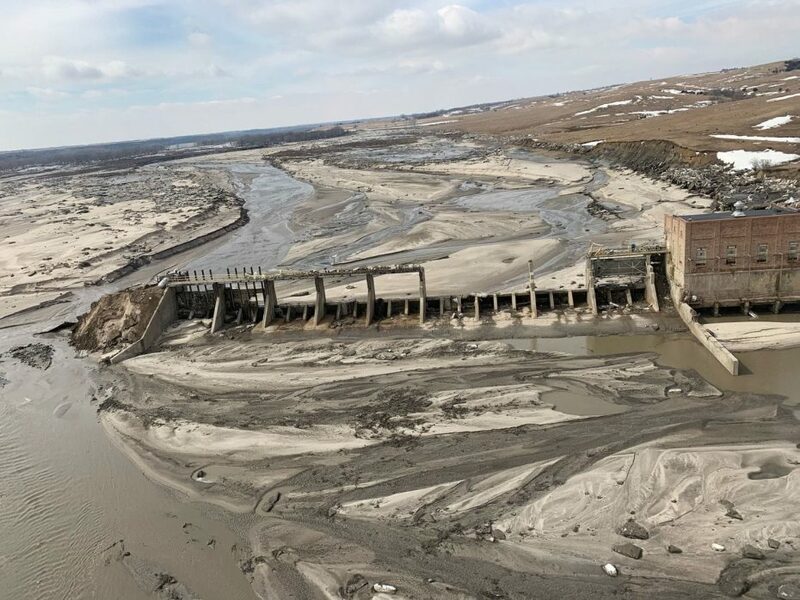 The failure of the dam released an 11 foot wall of water which moved quickly downstream with a destructive torrent of huge ice floes, and eventually emptied into the Missouri river, producing record flooding downstream. This video, from the Lincoln Journal Star, show the vast spreading of flood waters far removed from the failed dam. 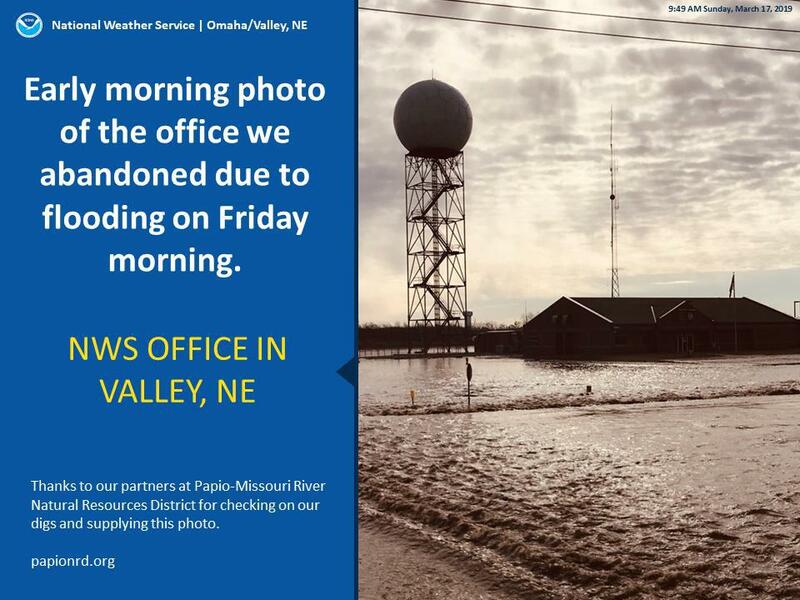 Two National Weather Service offices had to be abandoned, including the Omaha Forecast Office, which transferred operations across the state to Hastings. The southeast portion of Offutt Air Force Base, headquarters to U.S. Strategic Command and a key center for nuclear defense, had to be evacuated. Fortunately, there was enough warning for aircraft to be moved elsewhere. 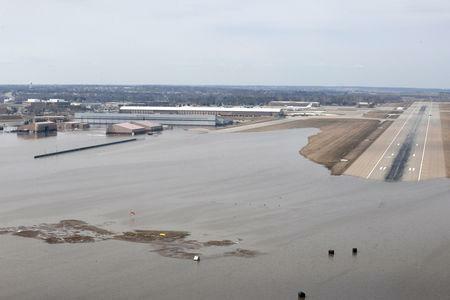 Although this was a weather event, the impact on Offutt is a reminder to Defense Department planners of the risk to so many U.S. military installations of more flooding from rising waters tied to climate change-driven increases in heavy precipitation events and sea level changes. The DOD has been studying and planning for these impacts over time, but much remains to be done. The low spawned what’s called a derecho: a long, linear swath of thunderstorms with violent, damaging straight line winds, as seen on NWS Doppler radars. This anomalous warmth presented greater temperature contrast with the arcic air west and north of the low center. That dynamic is a key ingredient for greater atmospheric lift and falling barometric pressure at the surface. The link between the current warm Gulf anomalies and a mean warming climate is not yet entirely conclusive, because other factors such as oceanic conveyor currents may also play a role. However, whatever the causes, the warm anomalies most certainly intensify storms due to the laws of thermodynamics. Even greater anomalies are also seen off the Atlantic seaboard. NOAA and university researchers are already post-mortem researching the genesis of this incredibly destructive storm. 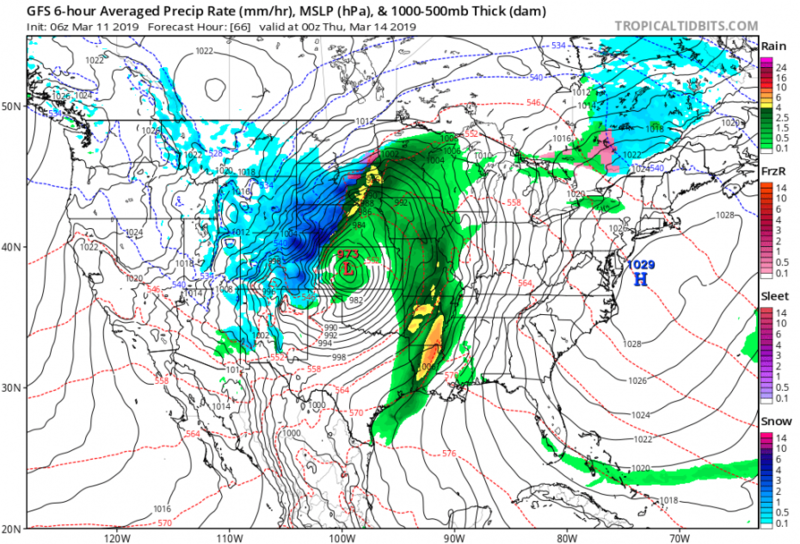 The good meteorological news is the suite of weather models and ensembles were able to generate lots of advance warning.